A lawn mower (also named as mower or lawnmower) is a machine utilizing one or more revolving blades to cut a grass surface to an even height. The height of the cut grass may be fixed by the design of the mower, but generally is adjustable by the operator, typically by a single master lever, or by a lever or nut and bolt on each of the machine's wheels. The blades may be powered by manual force, with wheels mechanically connected to the cutting blades so that when the mower is pushed forward, the blades spin, or the machine may have a battery-powered or plug-in electric motor. The most common self-contained power source for lawn mowers is a small (typically one cylinder) internal combustion engine. Smaller mowers often lack any form of propulsion, requiring human power to move over a surface; "walk-behind" mowers are self-propelled, requiring a human only to walk behind and guide them. Larger lawn mowers are usually either self-propelled "walk-behind" types, or more often, are "ride-on" mowers, equipped so the operator can ride on the mower and control it. A robotic lawn mower ("lawn-mowing bot", "mowbot", etc.) is designed to operate either entirely on its own, or less commonly by an operator by remote control. There are several types of mowers, each suited to a particular scale and purpose. The smallest types, non-powered push mowers, are suitable for small residential lawns and gardens. 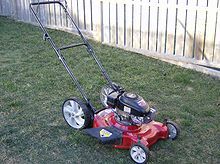 Electrical or piston engine-powered push-mowers are used for larger residential lawns (although there is some overlap). Riding mowers, which sometimes resemble small tractors, are larger than push mowers and are suitable for large lawns, although commercial riding lawn mowers (such as zero-turn mowers) can be "stand-on" types, and often bear little resemblance to residential lawn tractors, being designed to mow large areas at high speed in the shortest time possible. The largest multi-gang (multi-blade) mowers are mounted on tractors and are designed for large expanses of grass such as golf courses and municipal parks, although they are ill-suited for complex terrain. Budding's first machine was 19 inches (480 mm) wide with a frame made of wrought iron. The mower was pushed from behind. Cast-iron gear wheels transmitted power from the rear roller to the cutting cylinder, allowing the rear roller to drive the knives on the cutting cylinder; the ratio was 16:1. Another roller placed between the cutting cylinder and the main or land roller could be raised or lowered to alter the height of cut. The grass clippings were hurled forward into a tray-like box. It was soon realized, however, that an extra handle was needed in front to help pull the machine along. Overall, these machines were remarkably similar to modern mowers. The hover mower, first introduced by Flymo in 1964, is a form of rotary mower using an air cushion on the hovercraft principle. There are many variants of the cylinder mower. Push mowers have no engine and are usually used on smaller lawn areas where access is a problem, where noise pollution is undesirable and where air pollution is unwanted. As the mower is pushed along, the wheels drive gears which rapidly spin the reel. Typical cutting widths are 10 to 16 inches (250 to 410 mm). Advances in materials and engineering have resulted in these mowers being very light and easy to operate and manoeuvre compared with their predecessors while still giving all the cutting advantages of professional cylinder mowers. Their distinct environmental benefits, both in noise and air pollution, are also strong selling points, something not lost on many international zoos, animal sanctuaries and exclusive hotel groups. Mower blade — a blade that rotates in a horizontal plane (about a vertical axis). Some mowers have multiple blades. The blade features edges that are slightly curved upward to generate a continuous air flow as the blade rotates (as a fan), thus creating a sucking and tearing action. Extensive grass trimming was not common before the widespread application of the vertical shaft single cylinder gasoline/petrol engine. In the United States this development paralleled the market penetration of companies such as the Briggs & Stratton company of Wisconsin. Most rotary push mowers are powered by internal combustion engines. Such engines are usually four-stroke engines, used for their greater torque and cleaner combustion (although a number of older models used two-stroke engines), running on gasoline (petrol) or other liquid fuels. Internal combustion engines used with lawn mowers normally have only one cylinder. Power generally ranges from four to seven horsepower. The engines usually have a carburetor and require a manual pull crank to start them, although an electric starter is offered on some models, particularly large riding and commercial mowers. Some mowers have a throttle control on the handlebar with which the operator can adjust the engine speed. Other mowers have a fixed, pre-set engine speed. All are equipped with a governor (often centrifugal/mechanical or air vane style) to open the throttle as needed to maintain the pre-selected speed when the force needed to cut the thicker or taller grass is encountered. Gasoline mowers have the advantages over electric mowers of greater power and distance range. They do create a significant amount of pollution due to the combustion in the engine, and their engines require periodic maintenance such as cleaning or replacement of the spark plug and air filter, and changing the engine oil. Cordless electric mowers are powered by a variable number (typically 1–4) of 12-volt, 56-volt, and 80-volt rechargeable batteries. Typically, more batteries mean more run time and/or power (and more weight). Batteries can be in the interior of the lawn mower or on the outside. If on the outside, the depleted batteries can be quickly swapped with recharged batteries. Cordless mowers have the maneuverability of a gasoline-powered mower and the environmental friendliness of a corded electric mower, but they are more expensive and come in fewer models (particularly the self-propelling type) than either. The eventual disposal of worn-out batteries is problematic (though some manufacturers offer to recycle them), and the motors in some cordless mowers tend to be less powerful than gasoline motors of the same total weight (including batteries). While considered antiquated with the invention of powered mowers, the original type of push-powered reel mowers are still available. 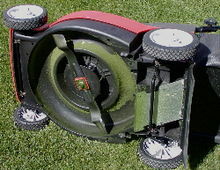 The reel is attached to the mower's wheels by gears, so that when the mower is pushed forward, the reel spins several times faster than the plastic or rubber-tired wheels turn. These types of reel mowers offer the benefit of zero pollution being produced. Since all of the energy necessary comes from the user, however, this method of mowing is the most strenuous and is not recommended for large lawns. Depending on the placement of the reel, these mowers often cannot cut grass very close to lawn obstacles, like trees, driveways, edging, etc., and also require a very smooth lawn surface to operate properly without bottoming out the cutter bar. Mowers can create significant noise pollution, and could cause hearing loss if used without hearing protection for prolonged periods of time. Lawn mowers also present an occupational hearing hazard to the nearly 1 million people who work in lawn service and ground-keeping. A recent study assessed the occupational noise exposure among groundskeepers at several North Carolina public universities and found noise levels from push lawn mowers measured between 86-95 decibels (A-weighted) and from riding lawn mowers between 88 and 96 dB(A); both types exceeded the National Institute for Occupational Safety and Health (NIOSH) Recommended Exposure Limit of 85 dB(A). To reduce the possibility of developing hearing loss and reduce noise pollution, users might consider the use of reel mowers or newer "green" or battery-operated mowers. Appropriate hearing protection such as earplugs or earmuffs will also help reduce the amount of sound that the user hears, which in turn can reduce hearing loss caused by lawnmowers. ^ ‹See Tfd›US RE 8560, ‹See Tfd›Passmore, Everett G., "Improvement in Lawn-Mowers", published 23 February 1869, issued 28 January 1879 ; see pg 1, col 2. For a copy, see Google Patents copy. This source indicates the patent number as "6,080". According to "British patent numbers 1617 – 1852 (old series) Archived 2011-10-17 at the Wayback Machine", the patent number would have been assigned sometime after 1852 and taken the form of "6080/1830". ^ a b c The Old Lawnmower Club. "Mower History". The Old Lawnmower Club. Retrieved 2011-04-23. ^ "The History of the LawnMower". backyardrefuge.com. Retrieved 2018-11-19. ^ a b c d Hessayon, D.G. (2007). The Lawn Expert. London: Transworld Publishers. pp. 28–33. ISBN 978-0-903505-48-2. ^ "How does a small engine governor work? | Briggs & Stratton". www.briggsandstratton.com. Retrieved 2018-03-22. ^ "Instruction Manual", web: MMHome-PDF Archived 2016-05-22 at the Portuguese Web Archive. ^ "OM, Black Bear ZTR", 2008, web: Dztr-manual. ^ Hollis, Scott. "Cordless electric lawn mowers: these battery-powered machines are clean, quiet and easy to maintain." Mother Earth News 209 (April–May 2005): 67(4). General Reference Center Gold. Gale. Fairfax County Public Library. 7 Apr. 2009. ^ Gu, Guanhui; Crane, Johne; Hornberger, George; Caricco, Amanda (2015-03-15). "The effects of household management practices on the global warming potential of urban lawns". Journal of Environmental Management. 151: 233–242. Bibcode:2013JEnvM.127..300K. doi:10.1016/j.jenvman.2015.01.008. PMID 25585139. Retrieved 16 February 2018. ^ NIOSH (Jul 25, 2018). "Grounds for Change: Reducing Noise Exposure in Grounds Management Professionals". Retrieved Aug 15, 2018. ^ Balanay, Jo Anne G.; Kearney, Gregory D.; Mannarino, Adam J. (Jan 2016). "Assessment of Occupational Noise Exposure among Groundskeepers in North Carolina Public Universities". Environmental Health Insights. 10: 83–92. doi:10.4137/ehi.s39682. ISSN 1178-6302. PMC 4909058. PMID 27330303. Halford, David G. (1999). Old Lawn Mowers. Shire Publications Ltd. This page was last edited on 24 April 2019, at 20:54 (UTC).